I have a confession; Ylang-Ylang Espresso now has a special place in my heart. The winner of Cosmopolitan magazine’s ‘Best Niche Fragrance’ award boasts of beating red rose, ylang ylang and jasmine notes. Boldly packed, the seductive fragrance is an audacious scent that crosses paths with a soothing cloud of just-brewed coffee, fresh cream and Sichuan pepper – sustainably harvested from the foothills of the Himalayas making this one of the top sustainable fragrances in the market today. The modern blend by Jerome Epinette for newly launched brand Floral Street that launched in 2017. With just 8 scents in the collection for those discerning noses and tight budgets starting at just £22.00. 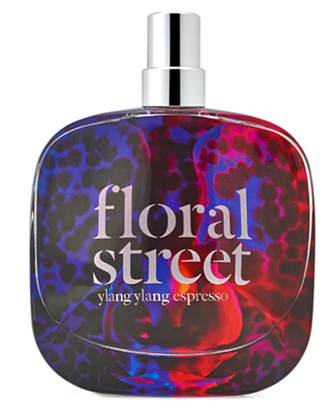 Floral Street is a dynamic fragrance brand born of the vibrant streets of London by founder Michelle Feeney. Feeney’s obsession with fragrance began when she was just three years old, starting with first smell of the gardenias in her great grandmother’s cottage back at home in Ireland. “I’ve been captivated by scent” writes on Floral Street’s flagship website. With an impressive resume from Tommy Hilfiger to MAC, Michelle finds young, urban British women inspiring. No signs of holding back, the brand has a flagship store in London’s Covent Garden which houses the collection of contemporary fragrances are powered by flowers. It is vibrant, energetic and feminine. Floral Street is all about breaking away from the tradition. It’s about ease, modernity and joy. This entry was posted in Beauty & Grooming and tagged Floral Street, Fragrance, National Fragrance Day. Bookmark the permalink.